The family dinner table – so symbolic, so real. 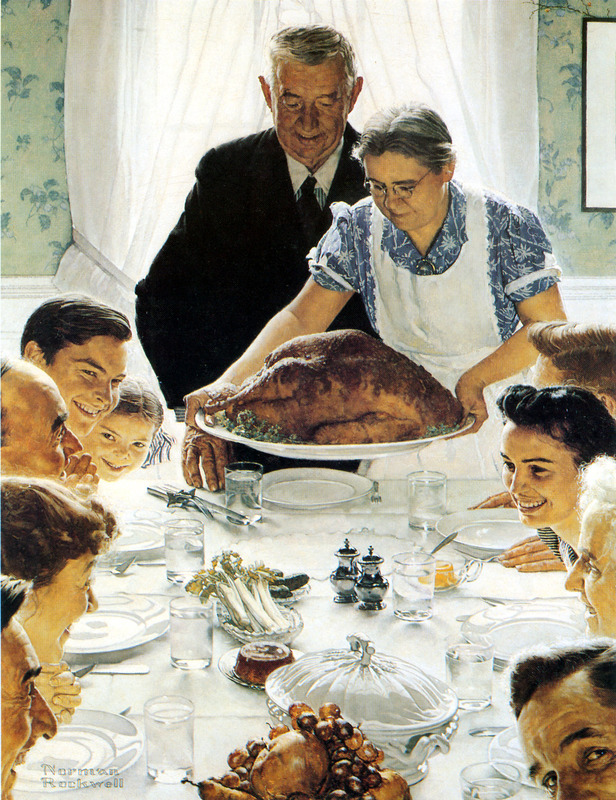 I tend to think of it in terms of the famous Norman Rockwell painting—people smiling, a feeling of community. But the reality can be so different—the vacant places of those who have left or who have passed. A surly teenager who really doesn’t want to be there. An alcoholic or abusive parent who uses his or her captured audience of children to wield power and control. These things of life are juxtaposed on each other—–the possibilities of incredible joy, but also incredible sorrow; – the presence of abuse, but also that of emotional support. I was reminded of this yesterday during Thanksgiving. I stretched myself yesterday by hosting a large gathering (large for me is 12 people). I blended family and friends. It felt risky to me—like a crapshoot—I wasn’t sure how the friends and family would connect. Would someone say something that was completely inappropriate and would there be awkward silences at the table? It turned out that everyone connected well, and seemed to have a good time. I reflected back on years ago, on my own childhood, and also in earlier adulthood when my husband and I were raising children. Life wasn’t always pleasant at the dinner table. Where some people talk about current events and share their days, and the parents enter into their children’s lives, the dinner table in my childhood years replicated my family structure—superficial, disconnected, and at times abusive. And I am sorry to say that in my earlier adulthood, I didn’t know how to connect at the dinner table either. Our default pathway is to replicate what we experience. I didn’t have good role models at the dinner table, and so didn’t know how to model it to my children. I passively allowed abuse to occur, as I was intimidated by it, and my son ended up leaving the dinner table in his teen years. I hate admitting this – that I allowed an unsafe place for my children. I didn’t chase after him or force him to comply because I knew it would backfire on me, but the fact that he left was telling – I knew that things had to change, and I knew I had a part in his leaving, and thus a part in changing myself. Yesterday was a milestone for me—a replication of Norman Rockwell’s painting—witnessing connection with the family at the dinner table—the abuse no longer – the prodigal son returned home – the presence of a loving family and wonderful friends. Yes, it was a day of Thanksgiving. Kim, I loved this post! So authentic, so you and your journey. Not at all where I was heading with my post on the holidays. I never wrote it, but am re-engaging my blog with a post tomorrow. Thanks for being real and inspiring others along the way. Thanks Ardis – glad it resonated with you.